​In the December 1997 Newark Senior Center newsletter, Eileen Thomas, Program Director, announced the center was awarded a grant from the National AmeriCorp Service program. AmeriCorp gave the center five refurbished computers and funded a program for beginner workshops in Word Processing, Internet and Email. In the fall of 1998, Marvin Hundertmark volunteered to start a computer club with seven people attending the first meeting: Eileen Thomas, Marvin and Beverly Hundertmark, Ellen Pringle, Betty Moseley, Dolly Meleski and Bud Ryan. Meetings were initially held in what is now the library and then later in the Evergreen Room. Membership dues were set at $5.00 per year (still unchanged). Eileen Thomas became the acting president followed by Anthony “Bud” Ryan as the first elected president (he was president for seven years). When the new Perry Education Wing was opened April 10, 2000, a new computer lab was established. 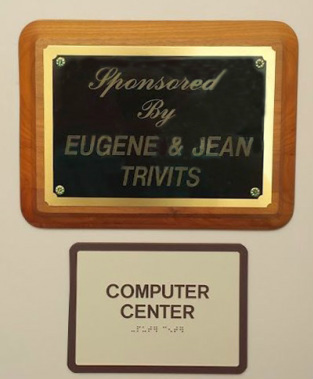 A donation from Eugene and Jean Trivits, Computer Club members, enabled the club to purchase additional computers for the new lab. The pictured plaque resides outside the computer lab as recognition of their generous gift. The club started with meetings once a month; Jim Kniskern taught a class in the art room, 35 attended and there were only 10 computers. As interest grew, weekly meetings and then open lab sessions were established. ​Jim also came up with the club nickname "Senior Surfers". Today, the club membership averages 400 members. The Senior Surfers Computer Club honors our departed members for their loyal and outstanding service to our club.